Life Groups represent groups of people interested in applying the bible’s teaching to their daily lives and willing to build each other up through prayer and fellowship. You will understand the bible better in a Life Group. You will develop leadership skills you never knew you had. 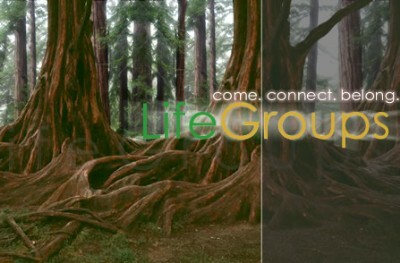 Connect to a Life Group today by clicking the different group links. So, what's with the trees in the photo above? Redwoods are the largest and oldest living things on the planet. They grow as high as a 30-story building and their trunks are as wide as a school bus. Some redwoods are over 2,000 years old. So, what is the secret of the redwood¹s strength and longevity? Most trees have a taproot, a large root that grows downward as deep as the tree is tall. The redwood is different, it¹s root systems typically delve only 8 to 10 feet, and this for a 300 feet-tall tree! Instead of growing down, the redwood¹s roots grow outward to a length three times the height of the tree. But even this can not provide the necessary support. The giant redwoods¹ secret is that they never stand alone. They grow in communities, or groves, where their roots intertwine and tangle together. This forms a root-web that helps the trees stabilize each other, resist high winds and storms, and even share water. The strength of each tree lies in the grove, not in itself. The same is true of us. In order to withstand the storms of life and the test of time, we have to be connected to a community, or grove, of people who depend on each other and fulfil our need to belong to something greater than ourselves. LIFE Groups at Bridges of Hope Fellowship are small communities of people who are committed to each other, God¹s Word, and to applying His truth to their everyday lives. LIFE Groups demonstrate that, just like the mighty redwoods, we are created to live in community; that we need each other; and that we truly are...BETTER TOGETHER!